This article is about the position in ice hockey. For the similar position in field lacrosse, see Goalkeeper (field lacrosse). For similar positions in other sports, see goalkeeper. For the basketball foul, see goaltending. The goaltender is also known as the goalie,  goaler, goalkeeper, net minder, and tendy by those involved in the hockey community. In the early days of the sport, the term was spelled with a hyphen as goal-tender. The art of playing the position is called goaltending and there are coaches, usually called the goalie coach who specialize exclusively in working with goaltenders. The variation goalie is typically used for items associated with the position, such as goalie stick and goalie pads. 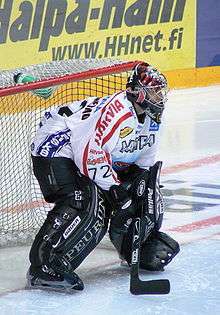 Goaltending is a specialized position in ice hockey; at higher levels in the game, no goalies play other positions and no other players play goalie. At minor levels and recreational games, goalies do occasionally switch with others players that have been taught goaltending; however, most recreational hockey rules are now forbidding position swapping due to outstanding injuries. A typical ice hockey team may have two or three goaltenders on its roster. Most teams typically have a starting goaltender who plays the majority of the regular season games and all of the playoffs, with the backup goaltender only stepping in if the starter is pulled or injured. Some teams have used a goalie tandem where two goaltenders split the regular season playing duties, though one of them is considered the number one goaltender who gets the start in the playoffs, such as the 1982-83 New York Islanders with Billy Smith and Roland Melanson; Melanson was named to the NHL Second All-Star Team for his regular season play while Smith won the Conn Smythe Trophy as the playoff MVP and both players shared the William M. Jennings Trophy for fewest goals allowed. The goaltender has special privileges and training that other players do not. He wears special goaltending equipment that is different from that worn by other players and is subject to specific regulations. Goalies may use any part of their bodies to block shots. The goalie may legally hold (or freeze) the puck with his hands to cause a stoppage of play. If a player from the other team hits the goaltender without making an attempt to get out of his way, the offending player may be penalized. In some leagues (including the NHL), if a goalie's stick breaks, he can continue playing with a broken stick until the play is stopped, unlike other players who must drop any broken sticks immediately. Additionally, if a goaltender acts in such a way that would cause a normal player to be given a penalty, such as slashing or tripping another player, the goaltender cannot be sent to the penalty box. Instead, one of the goaltender's teammates who was on the ice at the time of the infraction is sent to the penalty box in his or her place. However, the goalie does receive the penalty minutes on the scoresheet. If the goalie receives a Game Misconduct penalty, he is removed from the ice and a replacement goalie is played. Normally, the goalie plays in or near the goal crease the entire game, unlike the other positions where players are on ice for shifts and make line changes. However goaltenders are often pulled if they have allowed several goals in a short period of time, whether they were at fault for the surrendered goals or not, and usually a substituted goaltender does not return for the rest of the game. In 1995, Patrick Roy was famously kept in net by the head coach as "humiliation" despite allowing nine goals on 26 shots. In addition, if the team is losing near the end of the game or faces a delayed penalty call in control of the puck, they often pull the goaltender for a brief period in order to substitute in a normal skater for the extra attacker, albeit at the risk of an empty net. Out of the five positions on the ice rink, goaltenders are frequently candidates for the Conn Smythe Trophy as playoff MVP, as they have won this honor in four of the last ten playoffs. Patrick Roy has won a record three times, and four goaltenders have won the Conn Smythe as part of the losing team in the Finals. When a goaltender blocks or stops a shot from going into his goal net, that action is called a save. Goalies often use a particular style, but in general they make saves any way they can: catching the puck with their glove hand, deflecting the shot with their stick, blocking it with their leg pads or blocker or another part of their body, or collapsing to butterfly position to block any low shot coming, especially in close proximity. After making a save, the goaltender attempts to control the rebound to avoid a goal scored by an opposing player when the goaltender is out of position ('scoring on a rebound'), or to allow the goalie's own team to get control of the puck. Goalies may catch or hold a puck shot at the net to better control how it re-enters play. If there is immediate pressure from the opposing team, a goalie may choose to hold on to the puck (for a second or more, with judgment from the referee) to stop play for a face-off. If a goalie holds on to the puck for too long without any pressure they may be subject to a 2-minute delay of game penalty. Recently, in the NHL and AHL, goalies have been restricted as to where they can play the puck behind the net. Angle play: The method where, by positioning themselves in a direct line between the puck (not the shooter) and the net, a goaltender covers more of the net than he would otherwise be able to, and often "skulling" slowly, directly towards and closing on the opposing shooter to block more of the net. Two of the most notable angle goaltenders in the 1970s were Gilles Gilbert and Bernie Parent. Hasek roll: The Hasek roll is a desperation maneuver named after Czech goaltender Dominik Hasek. In the stacked pad stance the lower part of the net is protected very well, but the upper third is completely open. In a last-ditch effort to block an incoming high shot the goaltender can roll around his upper back, flailing his pads through the air and stacking them on the other side. If the timing is right the goalie might get his leg up just in time to make the save. Lie: The angle created between the handle(Paddle) of a goaltender's stick and the blade. The higher the lie, the closer the stick resembles the capital letter "L". A higher lie number of 15+ is traditionally for goaltenders who tend to stand up more in their stance; A lower lie number of 11 or 12 is for goaltenders who play with a more butterfly stance down on the ice more often. Screen shot: Screen shots are blind shots, in which the goalie can not find the location of the puck. Goalies should never anticipate or guess when and where the puck will hit. 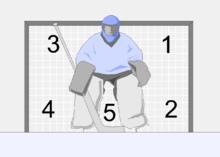 In the screen shot, another player (usually an opponent, but sometimes the goaltender's own teammate) stands between the shooter and the goaltender, obscuring the goaltender's vision of the shot. On a screen shot, the goaltender must do everything possible to try to see the shot, dropping to the butterfly stance and thrusting their glove out at the sound of a shot is not the best idea in the modern game. 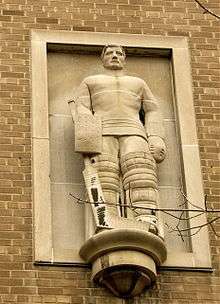 Some goalies, such as Ed Belfour or Ron Hextall, went as far as (illegally) punching players in the head or slashing their legs. The oldest playing style is the stand-up style. In this style, goaltenders are to stop the puck from a standing position, not going down. The goalies may bend over to stop the puck with their upper body or may kick the puck. Such saves made by kicking are known as kick saves or skate saves. They may also simply use their stick to stop it, known as a stick save. This was the style seen in the early NHL and was most commonly used up until the early 60s. One of the more notable goalies who was last seen using stand up was Bill Ranford, but most of the goalies from earlier decades such as Jacques Plante were considered pure stand up goalies. The advantage of the stand-up style is in the continued mobility of the goaltender mid save. While standing, a stand-up goalie can remain square to the puck and adjust his positioning to ensure that he is covering as much of the net at all times. He is also in a better position to stop pucks that are headed towards the upper part of the net. The main disadvantage of the stand-up style, however, is a susceptibility to shots travelling along the bottom half of the net. A larger percentage of shots occur in the bottom portion of the net, and a goaltender utilizing the butterfly will cover a larger portion of that area. If there is a screen, however, a stand-up goalie is generally in a better position to see the slapshot. Another style is the "Butterfly", where goalies go down on both pads with their toes pointing outwards and the tops of their pads meeting in the middle, thus closing up the five hole. This results in a "wall" of padding without any holes, lowering the chances of low angle shots getting in. These goalies rely on timing and position. Early innovators of this style were goaltending greats Glenn Hall and Tony Esposito who played during the 50s-60s and 70s-80s, respectively. Hall is credited to be among the very first to use this style, and both he and Esposito had tremendous success with it. The most successful goaltender to adopt this style was Patrick Roy, who has 550 career wins in the NHL. This is the most widely used style in the NHL today. "Butterfly" goalies have developed methods of sliding in the "Butterfly" position in order to move around fast in one-timer situations. As pad size increased, it became a more notable style of goaltending and is still evolving. This style of goaltending is a blend of stand-up and butterfly style, where the goaltender primarily relies on reaction, save selection, and positioning to make saves. Hybrid goaltenders will usually control rebounds well, deflect low shots with their sticks, will utilize the butterfly, and are generally not as predictable as goaltenders who rely heavily on the butterfly as a save selection. Most players are not pure stand-up or butterfly, but simply tend to prefer stand-up or butterfly over the other. If a player does not have any preferences, he is considered a hybrid goalie. All modern NHL goaltenders generally use some form of this style. Some goalies who do this effectively are Henrik Lundqvist, Ryan Miller, Jaroslav Halák, Jimmy Howard, and Tuukka Rask. The offended team, if in control of the puck, will pull their goaltender for an extra man. This is safe since as soon as a player on the team to be penalized touches the puck, the whistle is called, so they cannot score on the empty net. This effectively increases the one-man disadvantage beyond the standard penalty time. There are, however, situations, where a team scores on its own empty goal. The Vezina Trophy is awarded each year by the NHL to the league's most outstanding goaltender as voted on by the general managers of the league's 30 teams, from 1981-82 onwards. The Hart Trophy is awarded to the Most Valuable Player in the NHL. The Calder Trophy is awarded to the Rookie of the Year. A goalie scoring a goal in an NHL game is a very rare feat, having occurred only fourteen times in the history of the National Hockey League, the first time occurring in 1979 after the league had been in existence for six decades. NHL rules forbid goaltenders from participating in play past the center line, so a goal by a goalie is possible only under unusual circumstances. Seven of those fourteen goals resulted from the goalie shooting into an empty net. The remaining seven goals were not actually shot into the net by the goalie; rather the goalie was awarded the goal because he was the last player on his team to touch the puck before the opposition scored on themselves. Martin Brodeur is the only NHL goalie to be credited with three career goals (two in the regular season and one in the playoffs), Ron Hextall is the only goaltender who has scored two goals by shooting the puck into an empty net (once in the regular season and once in the playoffs). Damian Rhodes and José Théodore are the only goalies in NHL history to score a goal in which they also had a shutout game. Evgeni Nabokov of the San Jose Sharks was the first goaltender to score a power play goal. If a goaltender crosses the center line and shoots the puck from that location or any other location past the center line, the goal does not count. The first recorded instance of a professional goalie scoring a goal occurred on February 21, 1971, in the CHL. In a game between the Oklahoma City Blazers and the Kansas City Blues, the Oklahoma City Blazers were trailing 2-1 and decided to pull their goaltender. Michel Plasse, the goaltender for the Kansas City Blues then scored on an open net. Subsequently, four goalies have scored empty-net goals in the CHL: Phil Groeneveld of the Fort Worth Fire scored against the Thunder in Wichita, Kansas, on November 20, 1995; Bryan McMullen scored for the Austin Ice Bats on February 17, 2002; and Mike Wall of the Arizona Sundogs scored a goal against Corpus Christi on March 16, 2007. Danny Battochio is the most recent vs the Tulsa Oilers on December 31, 2011. ↑ Podnieks 2007, pp. 87–88. 1 2 3 4 Podnieks 2007, p. 88. ↑ Lapointe, Joe (April 16, 1997). "Time to Drop the Puck On Stanley Cup Season". The New York Times. Retrieved April 24, 2011. ↑ Lapointe, Joe (May 15, 1997). "Flyers' Question: Who Will Start in Goal?". The New York Times. Retrieved April 24, 2011. ↑ Diamos, Jason (June 3, 1997). "It's Snow As Flyers Switch Goalies". The New York Times. Retrieved April 24, 2011. ↑ Lapointe, Joe (June 8, 1997). "Legion of Brooms: Red Wings' Wait Ends With Sweep". The New York Times. Retrieved April 24, 2011. ↑ "Boston Bruins at Pittsburgh Penguins - 06/03/2013". NHL.com. Retrieved 16 June 2015. ↑ "404". TSN. Retrieved 16 June 2015. ↑ International Ice Hockey Federation. "IIHF Rule Book" (PDF). International Ice Hockey Federation. Retrieved 2008-10-18. ↑ National Hockey League (2007). "National Hockey League Official Rules" (PDF). Triumph Books. Retrieved 2007-10-20. ↑ Duplacey 1996, p. 25. ↑ National Collegiate Athletic Association (August 2008). 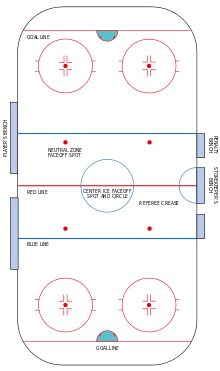 2008–10 NCAA Men's and Women's Ice Hockey Rules and Interpretations. Indianapolis, Indiana: National Collegiate Athletic Association. p. 178. ISSN 0735-9195. ↑ Harrison, Doug (2013-06-11). "Early Stanley Cup playoff MVP candidates". CBC News. Retrieved 2015-10-30. ↑ Steve Silverman. "Power Ranking the 2013 NHL Conn Smythe Trophy Candidates". Bleacher Report. Retrieved 16 June 2015. ↑ Korn, Mitch. "A hole is a hole is hole". Retrieved 12 February 2013. ↑ Custance, Craig. "Fifty years after Plante's breakthrough, goalie mask is about sanity, not toughness". Sporting News. Retrieved August 9, 2010. ↑ The Hockey News: Century Of Hockey, 1st ed. 2000, p. 20 - "As far as I am concerned, they can stand on their head(s). NHL president Frank Calder, announcing goalies can leave their feet to stop a puck"
↑ Rogers Digital Media. "Net worth: Top 5 NHL backup goalies". Sportsnet.ca. Retrieved 16 June 2015. ↑ " MacIntyre makes history in unlikely Moose win - AHL Goals Scored by a Goaltender:"
↑ Al Pearce (1995-12-20). "Admirals Briefs: Erie Goalie Joins Saurdiff As Scorer". DailyPress.com. Retrieved 2011-01-05. ↑ "50 Moments in Stingrays History". StingraysHockey.com. 2011-01-05. Retrieved 2011-01-05. ↑ "Game summary: Amur - Dinamo R : Kontinental Hockey League (KHL)". Retrieved 16 June 2015. ↑ "St. Louis Blues Player Page - Michel Plasse"
↑ "The Center Of Hockey: News". Retrieved 16 June 2015. ↑ Holland, Jim. "Battochio scores goal plays well in net as rush win". Retrieved 21 May 2013. 1 2 3 4 5 6 7 "Cornell Goalie Scores in Debut". Retrieved 16 June 2015. ↑ "Legends of Hockey -- NHL Player Search -- Player -- Damian Rhodes". Retrieved 16 June 2015. ↑ "Cornell freshman goalie Mitch Gillam scores goal in NCAA debut (Video)". Yahoo Sports. 27 November 2013. Retrieved 16 June 2015. ↑ maalivahti Mika Järvinen tekee maalin. YouTube. 4 December 2008. Retrieved 16 June 2015. ↑ Hockey Goalie Scores a Goal!!. YouTube. 2 May 2006. Retrieved 16 June 2015. ↑ Goalie scores Best Goal KOWALSKI Craig HC VALPELLICE. YouTube. 5 December 2009. Retrieved 16 June 2015. ↑ Frederik Andersens mål. YouTube. 15 March 2010. Retrieved 16 June 2015. ↑ hockey goalie (Jaakko Suomalainen) scores a goal. YouTube. 4 January 2011. Retrieved 16 June 2015.